We are enjoying a long fallish summer here in Denver, and the leaves are resisting the urge to drop, but I fear our beautiful weather is going to end soon. We've been trying to enjoy it while we can, so I haven't been sewing as much as I should (I have a few gifts I must finish up in the next week). I was able to bind this custom baby quilt last night, and it's a new favorite (isn't it that way with every quilt?). Inspiration for this quilt is here. I went bold on the backing...really bright orange. and bound in an aqua dot. oh, and besides the weather, I've been on a puzzle kick lately...my husband thinks it's a really boring time waster, but I love it. The quilt is gorgeous! I love doing puzzles to. There are one of my favourite Christmas holiday activities. I love this quilt! Do I see little red riding hood? Did you make up the pattern? Very very nice! Cute quilt! Love the three little bears print. 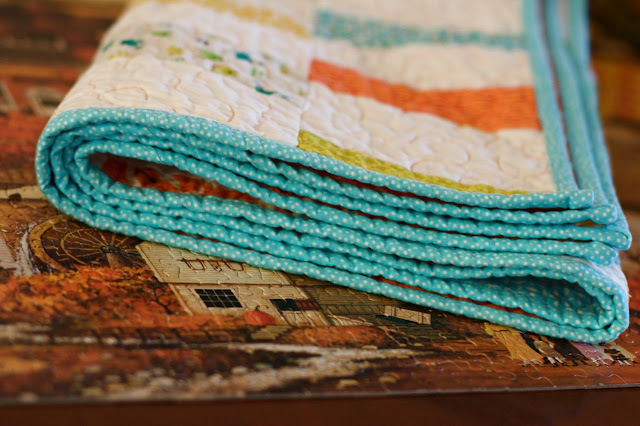 Great quilt and I love that binding! its so so so so cute! love the colors and the bold orange backing! Your quilts are always fabulous! The bright colors will be great for a baby. I love the random sizes of bricks in the rows. Will have to keep this in mind for future quilts. this is so cute...i love the pattern but am loving the color combination more. that orange stitching really makes it great!!! I love that Pattern! Also, good choice using a colored thread on the white background to quilt. So cute. Beautiful quilt! 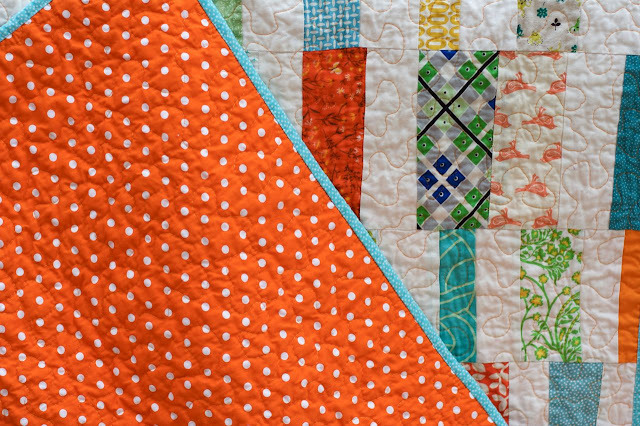 The bright orange backing is perfect for a baby quilt. That color will surely catch their eye! 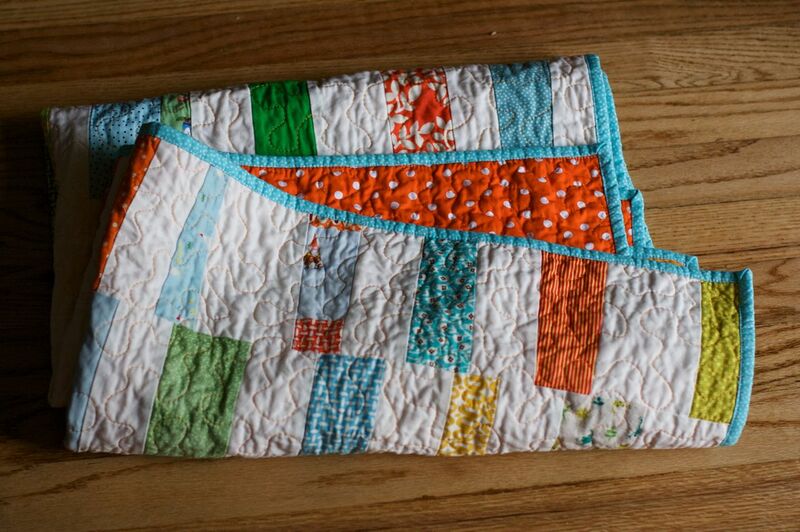 I love it, especially the orange quilting and back, paired with the blue binding...it looks so crisp against the white on the front. I can see why this is a favorite! It is gorgeous Nettie!!! I also love to do puzzles but I tend to do them only around Christmas. How nice is that? Really cute and original. And very inspiring. I love it. Love the look of the quilt....so fresh and full of life.. It's beautiful! 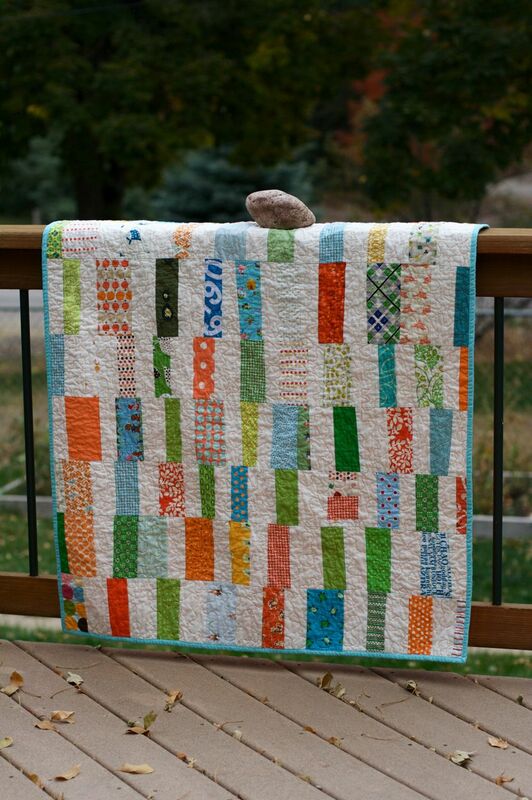 Looks like a great quilt to use scraps. 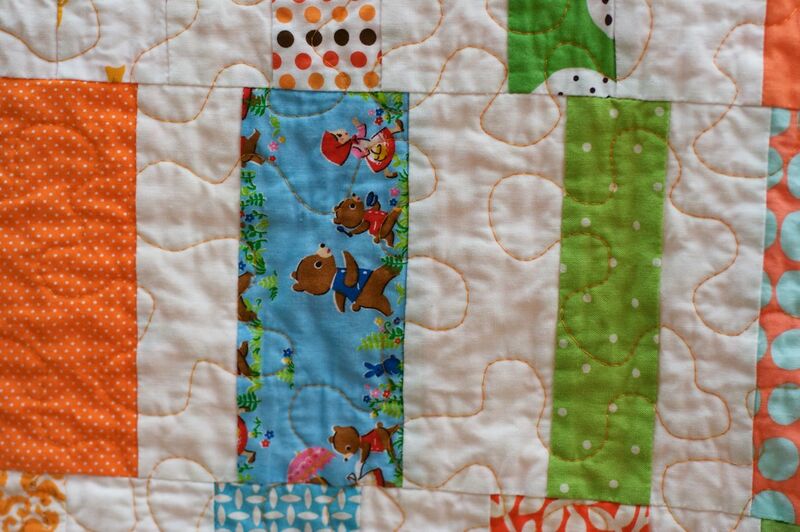 It also kinda looks like a fun I-spy quilt, hunting for all those fun prints you used. BTW, I love to do puzzles too! it's super cute, nettie! i always love all the quilts you make. always! i love puzzles, too. i usually have to seer clear, because i get sucked in and get nothing else done. Nice quilt! I like to leave a puzzle set sometimes and put it together here and there. It's neat because you often see someone in the family stopping for a second to put a few pieces in place. Enjoy the nice weather! love the orange with the aqua! and i love doing puzzles too. Wow, that is a beautiful quilt! I love all the color! Such a lovely colourful quilt! I particularly like the spots on the back and the binding. I'm a bit of a puzzle addict myself and get nothing else done if I have one out. It looks so great and I love the orange thread and backing!! This is lovely! I love the backing and binding -- perfect combo. Puzzles! They are about the only thing that can keep me away from my fabric. love the fabric and the quilt. Nice to see orange. I love puzzles too. They are a great day to let the brain come down a little. I love it. It's so bright and colorful, and not gender specific, so it's great for anybody! As usual, great job on this one! It's so cute! I especially love the orange back with the aqua binding. Love that color combination. Great job! This is so pretty! I love it. I also enjoy puzzles from time to time; they are so relaxing! Did you know that there is a Modern Quilt Guild here in Colorado now? Love, Love, LOVE! So cute, fresh, modern, bright. I want one. Guess it's time to get to work. That looks like a Charles Wysocki puzzle under your cute quilt. I love Wysocki puzzles and have lots of them. Not much time to work on them I'm sad to say. Quilt making comes first. such a happy, beautiful quilt... i love the dotty binding too! Nettie you have such a fun style and I love your fabric choices--so refreshing! Cute stuff as always! This is so nice...simply lovely! I love the bold orange on the back...wow! Whimsical, modern and sweet. I love it. Love the colors, particularly the backing and the binding. The quilt is so fresh and fun..... just beautiful. Thanks for sharing your art. love how right your work is. Mmmm...love me them aqua polkadots!